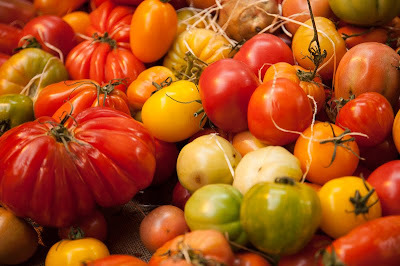 Heritage tomatoes are all the rage now, we love all these odd shapes and colours. Heritage is possibly a bit too grand a nostalgic word for tomatoes, as it wasn't too far back when this part of the world considered them inedible. Known as "wolf-peaches" as only wild animals could possibly eat them. Makes you wonder what we might be eating in the future. Heritage tomatoes come the closest to tasting like the tomatoes I ate as a child. Every now and then I'll run across one that tastes like I think a tomato should taste. I'm sure glad that wolf peaches are now a part of our diet. How colorful, warm, tasty and curious! Love these! We just had a great tomato season this side of the pond, and these beauties are always a sight for sore eyes. Tomatoes are recent? I didn't know that. What did Italians put on pizza before them?